This week my MakeZine newsletter had an interesting article in it that referenced a post called Miles per Gallon vs. Gallons per Mile. Which car replacement would save you the most gas? Of course this is one of those tricky math tricks that your average American gets totally wrong because the curve on this kind of think is non-linear. 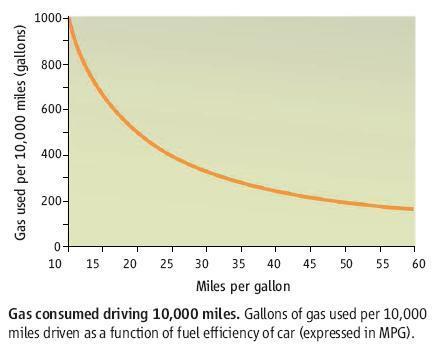 When you run the numbers, replacing the 34 MPG car with a 50 MPG (a 16 MPG improvement) car saves you 94.1 gallons per 10,000 miles, whereas replacing the 18 MPG car with a 28 MPG (a 10 MPG improvement) car saves you 198.4 gallons per 10,000 miles – more than double the savings. Or, to give an even more clear-cut example, replacing a 5,000 MPG car with a 10,000 MPG car saves you just one gallon of gas, whereas replacing a 1 MPG car with a 2 MPG car saves you 5,000 gallons of gas, using a fixed mileage of 10,000 miles driven for comparison. Read the entire post for all the info. Nice work bunnie!